Peter Pau, the co-director of China's grandiose, CG-heavy blockbuster Snow Girl and the Dark Crystal, is no stranger to the realm of the outlandish. While his efforts in the director's chair are few, his eye as a cinematographer has been responsible for capturing the beauty of numerous different martial-arts fantasies, from the carefully elevated realism of his Oscar-winning work in Crouching Tiger, Hidden Dragon to the colorful, energetic zaniness of the cult classic Bride With White Hair. Expectations that Peter Pau and Tianyu Zhao might draw from his prior work for something similar were naturally kept in check after seeing the film's busy trailer, though, which mixes overzealous graphics and odes to ancient folklore in what looks more like a stream of videogame cutscenes than a motion picture. What wasn't expected was how dreadfully weak both the garish visuals and laborious storytelling would appear in the final product, resulting in a befuddling waste of its underlying production value that struggles to justify its existence. The plot for Snow Girl and the Dark Crystal wedges into an awkward zone between simple archetypal storytelling and elaborate mythological twists and turns, hinged on the struggle between Heaven and Hell over the fate of the human realm in ancient China. 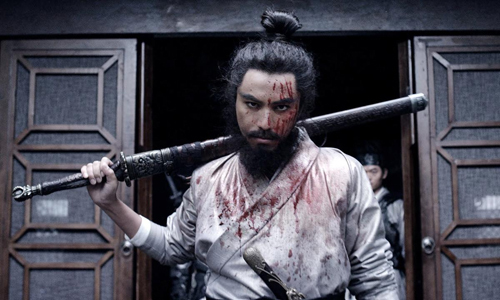 As a doomsday moment approaches where the denizens of the underworld will come to claim the souls of humanity, heavenly figure Zhang Daoxian (Winston Chao) ramps up his magical training of a demon slayer, storied Chinese antihero Zhong Kui (Painted Skin's Chen Kun), to counter their offenses with a super-powerful being and safeguard a significant crystal recently retrieved from them, which shall be kept in a large human town that reveres the divine. Hell has its own tricks up its sleeve: Snow Girl (Snow Flower and the Secret Fan's Li Bingbing), a loyal ice spirit and her troop of beautiful shape-shifting demons, someone with connections to Zhong Kui from years ago. When the two meet up again as the war for humanity's souls approaches, allegiances are tested and details are revealed about the nature of their masters, as well as the truth about Zhong Kui's past. Despite being a committed sentinel to the human realm equipped with a mystical fan that bequeaths him with the size and strength of demons whenever used, the story relies on Zhong Kui actually being a pretty clueless demon slayer and protector of his designated city. His apprehension, booziness, and the ease in which he's snowed-over becomes one of many brainless aspects of Snow Girl and the Dark Crystal, coupled with a bunch of haphazard magical artifacts, potions, and spells that either fix or complicate things at the fickle demands of the story. Disjointed flashbacks that reveal aspects of Zhong Kui's past and fleeting romantic history with Snow Girl attempt to fill in the (plot) holes of his integrity as a character; however, the underdeveloped chemistry between them and the crucial details revealed within these backward glimpses further weaken the increasingly clumsy plotting. Most of these martial-arts visual extravaganzas require some hefty suspension of disbelief, but the stumbles here make for an inescapably problematic narrative that detracts from the film's potential sensory delights. Snow Girl and the Dark Crystal overestimates the stability of its storyline's foundation, but it also overestimates the bombast and credibility of its visual opulence, too. Little wisps of blue magical essence and frost effects add a dose of appealing whimsy to the interactions between god-like individuals, which look nice when paired with the attractively-lit shots of actual people -- Chen Kun and Li Bingbing are, predictably, fine eye-candy -- and the film's tangible production design, from flowing garments and hair ornaments to hand-painted art. These moments are so crowded by cumbersome computer-generated footage that they fall to the wayside, though, with mediocre visual renderings giving stilted life to the huge mythical beasts and sprawling landscapes. Towering CG models of molten demons and flying ice spirits struggle with rigid animations, to which the blockbuster nature of the film doesn't even attempt to conceal their uncanny-valley faults, letting these brawny beasts duke it out in unconvincing swaths of digital wizardry. Perhaps the most considerable issue with Snow Girl and the Dark Crystal lies in its persistent, uncontrollable escalation of stakes and involvedness, especially after the halfway mark. Layering arcane plot revelations atop one another while mythical figures square off in boisterous battles, the overpowered and arbitrary nature of these gods and demons leaves a lot of "They can do that?" and "Why didn't they do this?" and "Why did that happen?" questions hanging in the air, overshadowing the story's hammy flips in ideologies and romantic overtures -- which is no small feat. Everything about this flick hinges on those watching being disarmed by the scope and mystical splendor of it all, even tossing in a pair of overt nods to The Avengers and Superman within about a five-minute span to really slam the point home. Instead, down to its brazenly unearned bittersweet ending, Snow Girl and the Dark Crystal forms into two hours of kaleidoscopic irritation that'd be better spent grabbing a controller and playing one of countless videogames with a clearer perspective than this dud. Thoughts? Love to hear 'em -- if they're kept clean and civil.